In the first of this three-part series of blog entries on impairment and the new IFRS 9 we laid the groundwork and introduced the reader to the intricacies of the new standard. In this blog entry, we expand by looking at a worked example. Provost Limited prepares its accounts annually to the 31st December. On the 1st July 2017, Provost Limited advanced a three-year interest-bearing loan of TT$2,000,000 to Dodgy Inc.
On initial recognition Provost Limited should recognise a credit loss provision equivalent to 12 months expected losses. 12 months expected losses = 2.5% x TT$800,000 = TT$20,000. At 31st December 2017, Provost Limited must estimate whether the credit risk has increased significantly since the loan was originally recognised on the 1st July 2017. According to the table above, the total risk of default has increased from 7.5% to 13.0%. This increase is clearly significant. Provost Limited must also consider whether the absolute credit risk is low. Although the term “low” is not defined in IFRS 9, IFRS 9 does refer to an example of low credit risk being an external credit risk rating of “investment grade” (minimum grade of BBB). 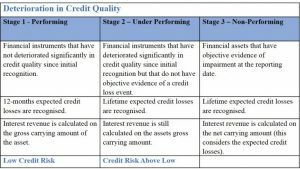 An investment grade credit rating implies that an entity continues to have the capacity to meet its financial commitments under a loan instrument. The credit loss provision at the 31st December 2017 should be based in lifetime expected losses. Lifetime Expected Losses = (3.0% + 10.0%) x TT$700,000 = TT$91,000. Provost Limited must again evaluate whether its credit risk has increased significantly since the 1st July 2017. Since the total risk of default has now decreased to 3.0%, the total risk of default is now lower than it was at the point the loan was first recognised. The credit loss provision should therefore return to being based on 12 months expected losses. 12 months expected losses = 1.0% x TT$500,000 = TT$5,000. IFRS 9 requires that the basis of calculating credit losses switches from 12 months expected losses to lifetime credit losses when there has been a significant increase in credit risk since the loan or instrument was initially recognised. To make this assessment, Provost Limited compared the risk of default occurring on the loan as at the reporting date (the 31st December each year) with the same risk at the date the loan was initially recognised. Provost Limited is expected to use “reasonable” and “supportable” information that is available without undue cost or effort to determine whether credit risk has increased significantly. This includes forward looking information as well as historical data such as the past due status of the loan. There is a rebuttable presumption that the credit risk has increased significantly since initial recognition when contractual payments due under the loan are more than 30 days past due. This presumption can be rebutted only when Provost Limited has reasonable and supportable information available that 30 days past due does not represent a significant increase in credit risk. How is Default Defined under IFRS 9? IFRS 9 does not provide a definition of default. Businesses are expected to define default in a manner that is consistent with the definition that they use internally for credit management purposes. This definition would also consider the terms of covenants relating to the loan granted. There is a rebuttable presumption under IFRS 9 that states that default does not occur later than when a financial asset is 90 days past due unless a business has reasonable and supportable information to demonstrate a longer time-period is more suitable. Closing thoughts – a time to chill and a time to invest? Firstline Securities Limited offers comprehensive coverage of local and international markets with a bias for the energy sector. Firstline offers many unique opportunities to put surplus cash to work either as your asset manager or investment advisor. Please contact us for more details at info@firstlinesecurities.com or at 868.628.1175, we can discuss your investment needs in detail and craft a portfolio that makes sense for you. We look forward to hearing from you.